Beneath its hard, unforgiving exterior, winter squash offers a sweet delicious treat worth the preparatory efforts—on its own or combined with other fall flavors. Harvested in the fall, winter squash varieties include butternut and acorn squash (which are typically available year-round), as well as kabocha, Delicata, hubbard and other types that are a little more out of the ordinary. 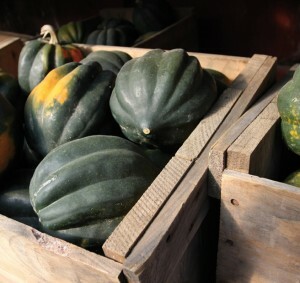 Winter squash belong to the same family as summer squash; the difference lies in the fact that they are allowed to grow until their skins harden, which enables them to be stored over the winter. As a result of the long growing period, their flesh becomes a little sweeter than summer squash. Although the exterior shapes vary from squatty turbans to elongated footballs, the interiors are generally dark yellow to orange, and sturdy in texture. Winter squash are flexible; they can be steamed, sautéed, roasted or boiled, and are a great source of vitamins. Because they are difficult to peel, I prefer to use smooth, easier-to-peel varieties for the recipes that require removing the skins before cooking. A “Y”-shaped vegetable peeler is my tool of choice for the job, although a small paring knife also works well. Use caution, however, as the tough skin requires quite a bit of force to peel. For squash with ridges or shapes that would be difficult to peel, stick to recipes that call for cooking the squash before scooping out the flesh. 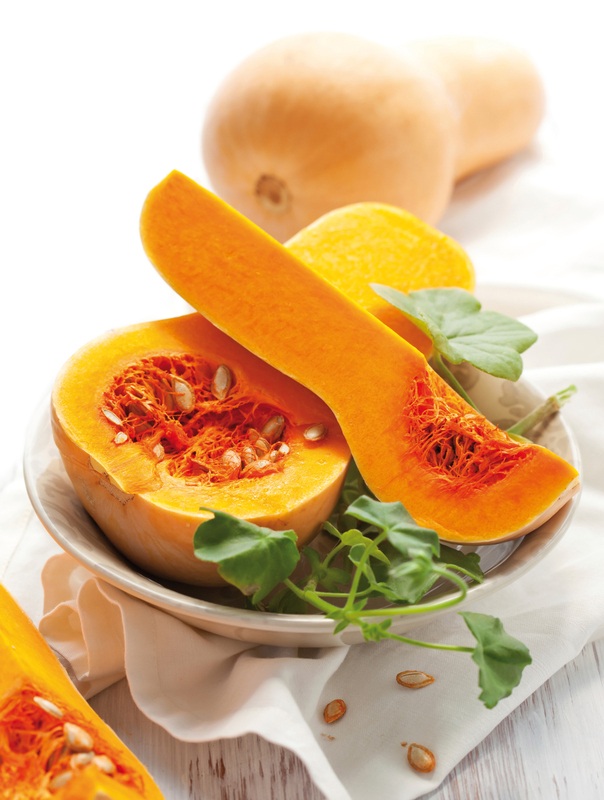 When shopping for squash, choose those that feel heavy and dense and have smooth, unblemished skin. Store them in a cool, dry place with plenty of ventilation; it’s not necessary to put them in the fridge, and don’t leave them in a plastic bag. The sweet flesh goes well with many winter flavors and dishes—pasta, risotto, bacon, and nutty cheeses like Gruyere and pecorino. Don’t overlook the most obvious preparation—splitting the squash in half, scooping out the seeds, rubbing the cut side with olive oil and roasting in a hot oven until soft and caramelized. If you’re in the mood for a little more adventure, try these recipes. Enjoy! Tagine is a type of dish served in Northern Africa; it’s also the name of the earthenware pot it’s cooked in. This is a delicious vegetarian dish, but you could add some chicken if you like. In a heavy pot, sauté shallots and garlic in oil for 10 minutes. Add the squash and continue cooking for another five minutes, stirring often. Add the prunes, zest, ginger, stock, chickpeas, cinnamon and cayenne, and season with salt to taste. Bring to a simmer, then cover and continue to simmer for 10 minutes. Check squash to make sure it’s cooked through, and taste for seasoning. Serve the stew over couscous, and garnish with parsley and almonds. 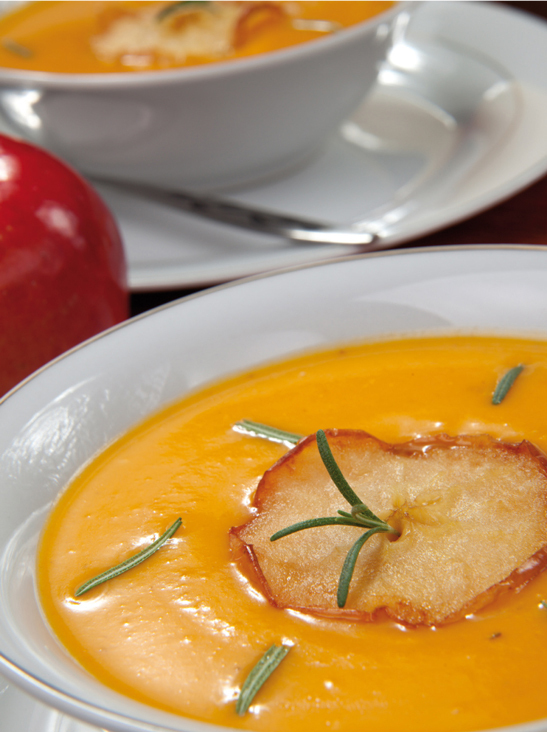 The sweet flavors of roasted squash, apples and onions are a real treat in this soup. Preheat oven to 350. Line a baking sheet with foil, spray with nonstick spray. Place squash, apples and onion halves cut side down, and bake until tender, about 30 minutes. Let cool 10 minutes. With a spoon, scrape the flesh from the apples and squash. Peel and discard the browned skins from the onions. Place the squash, apple and onion in a food processor with a cup of stock, and puree until smooth. Transfer to a saucepan. Add the remaining stock, cream, and salt and pepper to taste. Cook over low heat for 10 minutes to blend flavors. Garnish with toasted pumpkin seeds. Eat this as a main course, or as a side dish with grilled meat or fish. Black rice, or forbidden rice as it is sometimes called, turns a beautiful dark purple when cooked. This salad is almost as enjoyable to look at as it is to eat! Preheat oven to 400. In a large bowl, toss squash and 3 tablespoons olive oil. Season generously with salt and pepper, and place on a sheet pan in a single layer. Toss scallions with 1 tablespoon olive oil, and place on a separate cookie sheet. Roast both for 30 minutes, stirring after 15 minutes, and watching the scallions carefully so they don’t overcook. In a small bowl, combine the syrup and mustard. Pour over the squash and scallions, and return to the oven to roast for another 10 minutes. Scrape both into a large bowl and add the cooked rice. While the squash is roasting, put the balsamic vinegar and brown sugar in a small saucepan, and reduce over low heat until syrupy. Toss the squash/rice mixture with arugula, balsamic glaze, 4 tablespoons olive oil, and salt and pepper. Garnish with cheese and serve at room temperature.